The latest Google Android phone I’ve had the pleasure of reviewing is the LG Optimus One which is also known as the P500. The LG Optimus One (P500) gives you the latest Android Experience at an affordable price. Powered by Android 2.2 (Froyo) and optimised for Google Mobile Services, the handset delivers the ultimate smartphone experience while offering easier accessibility for the growing number of consumers looking to purchase their first smartphone. I’ve added the emphasis on affordable price as this device give you all the bells and whistles, like GPS and wif, without costing an arm and a leg. I really enjoyed reviewing this device with the all to familiar Android features that make switching from on Google Android device to another as simple as popping in your sim card and syncing your Google account. No longer will users be forced to be locked into a specific manufacturers device when you feared that your contacts, probably the most important thing on your phone, will be lost or cannot sync with a different device. There is a plus side to having everything stored in the cloud. So will 2011 be the year of Andoid? Being a Web AddiCT is sure believe so seeing that sales of Android powered phones are exceeding other smart phones with manufacturer specific operating systems. 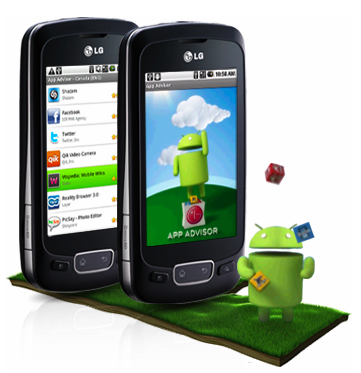 The LG Optimus One is a great addiciton to the list of Android phones available in South Africa. 📝 Have you thought about... ? Mobile Phones ? Will 2011 be the year of Android?